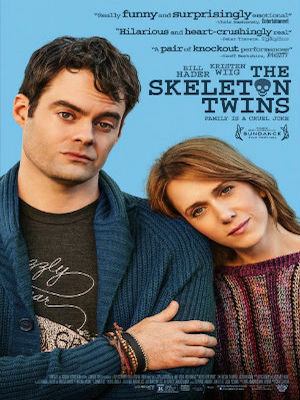 For this week’s article, I was unsure if my opinions on the film The Skeleton Twins would be better expressed as a review or an analysis. I decided to write a review that would go a little more in depth with the plot and thematic elements of the film. That means that this article will have some spoilers for the film so read at your own risk. I did not have a lot of knowledge about the film going into my viewing. I saw the trailer about a year ago and knew it starred two Saturday Night Live alums, Bill Hader and Kristen Wig. I figured it would be a bit comedic with subtle drama. Within the first five minutes it was pretty clear that I was quite a bit off on my assumption and this film would be a whole lot deeper than I imagined. The film starts off with the two main characters (who are also twins), Milo and Maggie, attempting to commit suicide in their respective homes. Milo lies in a bathtub and slices his wrists, while Maggie is in a bathroom getting ready to swallow a handful of pills. Maggie is interrupted by a phone call from the hospital letting her know her brother was admitted after trying to kill himself. Long story short, after picking up Milo from a hospital in Los Angeles, Maggie brings Milo back across the country to live with her. During the course of the film we learn a lot about our main characters, and if we are not careful, and only pay attention to their current actions, it is very easy to despise both of them. On one side, we have Maggie, who has cheated on her husband with three different men in the last year, while taking birth control pills during their attempts to have a child. On the other side, we have Milo, who is in an affair with a man in a relationship. While it seems like the point of the movie is two showcases to the audience two horrific people, the dark tone of the film suggests that there is an underlying message that needs to be uncovered. In my opinion, the true meaning of the film comes towards the end of the third act, when we learn that Milo and Maggie’s father committed suicide when they were young, leaving them to fend for themselves with their pretentious, narcissistic mother. In addition to this horror, we learn about Milo being molested by his high school teacher (who is also the man he is having a relationship with in the film) as a child and how Maggie was responsible for telling the school about the incident. Once this information is revealed, our characters seem to be presented in a whole new light. Instead of being the horrible people we thought them to be, they are actually very damaged individuals who have not recovered from their past. Milo constantly goes back to his teacher because in his eyes, that man is his first love, instead of the man that abused him. Maggie is afraid of being a mother because of the depression and suicidal thoughts that she experiences, which may end her life, just as they did to her father. The point of this film is to show you that as a society we often judge individuals and label them as bad, when in reality, they have underlying demons that control their actions, which we could not possibly understand. Overall, I actually enjoyed the film a lot, even though it had a completely different feel than I expected. It was still able to deliver on a comedic level while also portraying a very unique message. I did not feel like any of the characters were flat or stereotypical, as they all seemed to evolve in different ways throughout the course of the film. In fact, I would say that these were some of the best characters that I have seen in a film in a very long time. The film was also paced very well and had me engaged the entire time, whether it be long drawn out conversations that revealed a characters back story, or the bright spots in the film that actually made you smile, such as Milo and Maggie’s rendition of Starships “Nothings Gonna Stop us Now”. Unfortunately, the film did have one fatal fall in my opinion, which is its ending. Throughout the final act of the film, it was apparent that Maggie would kill herself when, out of nowhere, she is saved by Milo, followed by a brief montage showing they are living a happy life. Personally, I felt like this ending does not stay true to the tone of the film, and it feels like something that was implemented by studio executives in order to continue the trend of “Happy Hollywood Endings”. The writers foreshadowed water-related death earlier in the film with twin goldfish dying, and personally I believe the writers intended to have both siblings in some way commit suicide by drowning. In conclusion, I highly recommend this film, as it gives the audience a unique view on people that we normally do not take, which is something that I will definitely take away from the film and apply in real life. In addition to providing real life application, the film is also really enjoyable due to how well written its characters are. Taking all of this into consideration, I would give the film 4 out of 5 reels. While it succeeded on so many levels, the ending fell flat and left me walking away with a bad taste in my mouth. As always thank you for visiting Celluloid Cinema and feel free to give us your opinion of the film in the poll and comments below.